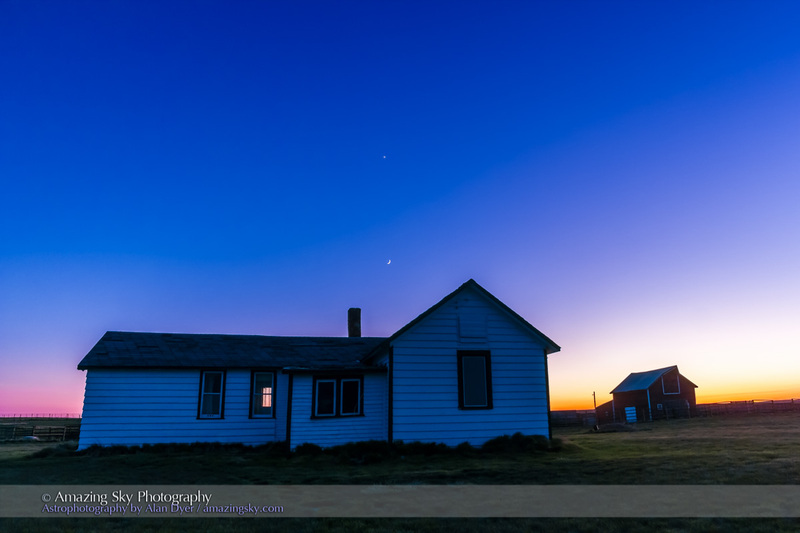 The waxing Moon and Venus shine over contrasting landscapes, both urban and rural. 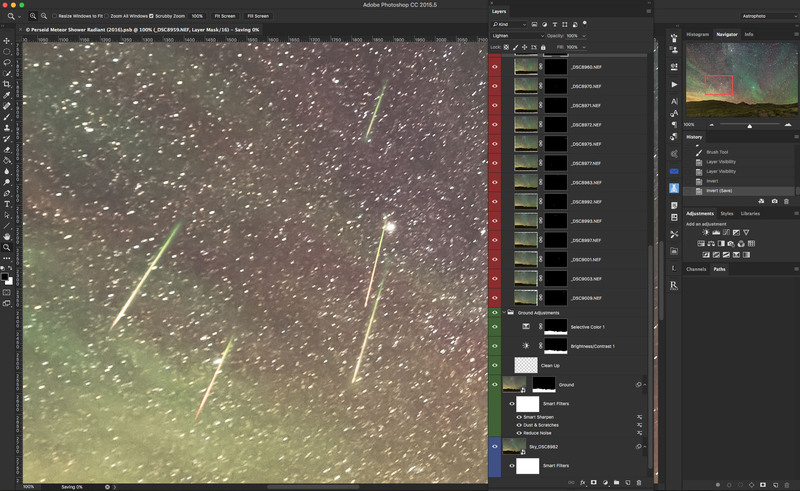 I shot the main image at top last night, May 21, from a site overlooking the urban skyline of Calgary, Alberta. The waxing Moon shines near Venus in the twilight sky. 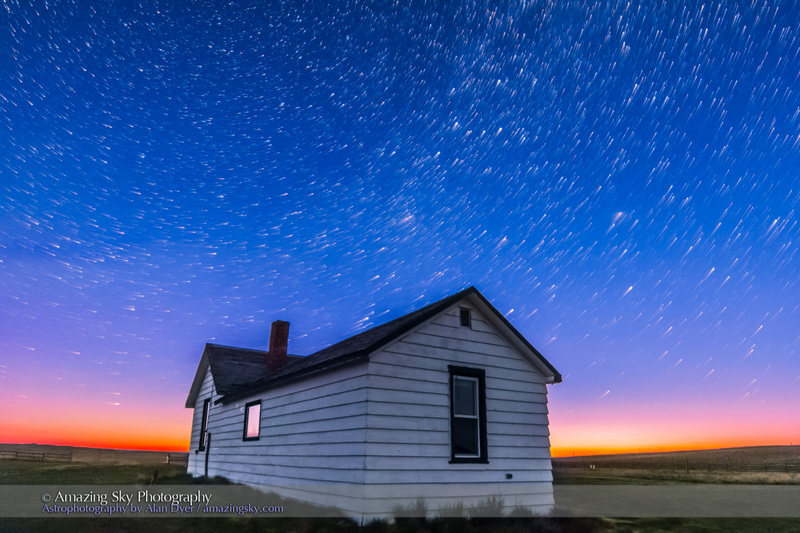 By contrast I shot the image below the night before, from a location that couldn’t be more different – remote, rural Saskatchewan, on a heritage farmstead first settled in the 1920s by the Butala family. It is now the Old Man on His Back Prairie and Heritage Conservation Area. Here, the crescent Moon shines a little lower, below Venus, amid the subtle colours of twilight in a crystal clear prairie sky. 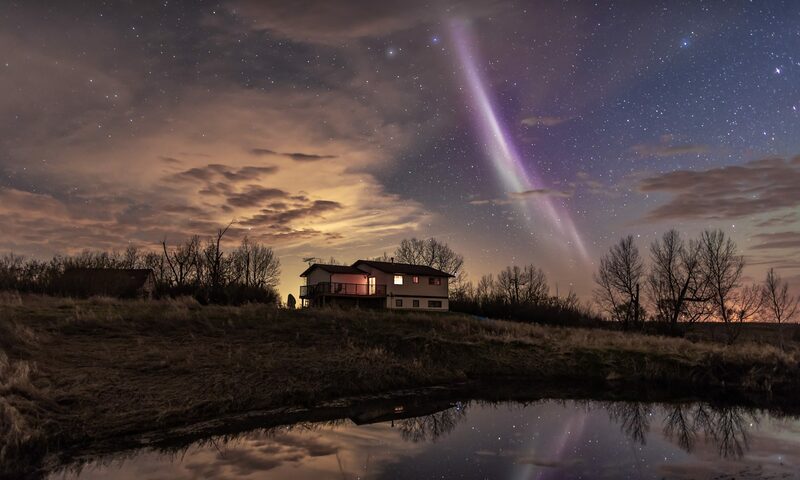 However, as the top image demonstrates, you don’t need to travel to remote rural locations to see and photograph beautiful sky sights. 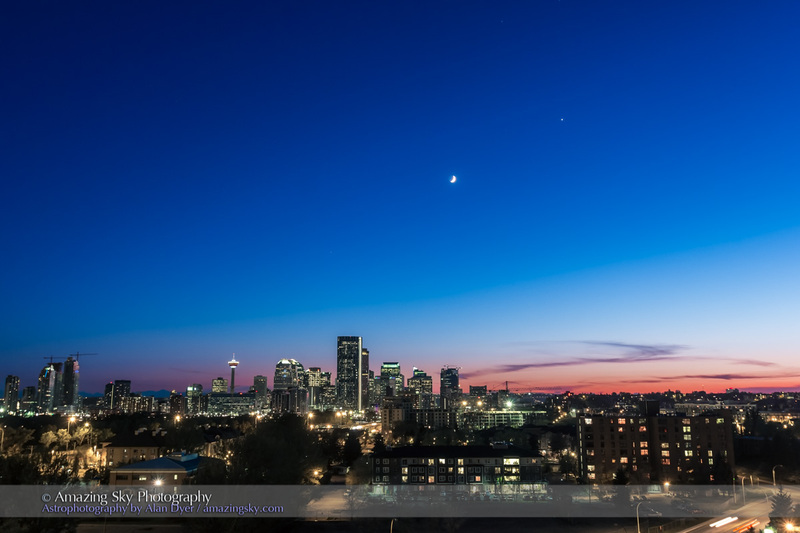 Twilight conjunctions of the Moon and bright planets lend themselves to urban nightscapes. 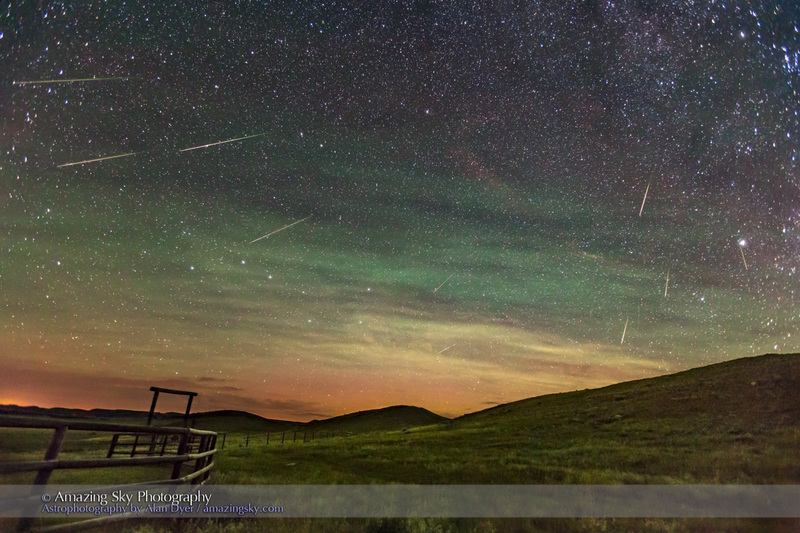 The Milky Way and the Northern Lights arch across the sky in the Frenchman River valley of Grasslands National Park. • The Milky Way rising out of the northeast at left and stretching across the sky overhead at top and down into the southwest at right of centre. • And the Northern Lights, as an arc of green and red across the northern horizon. They got brighter and higher later this night, August 26/27, as my previous post shows. 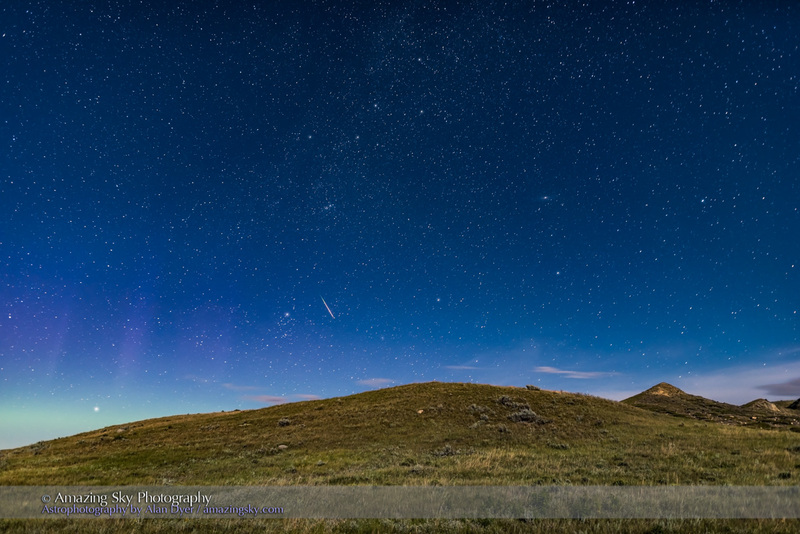 Bands of green airglow also stretch across the sky from east to west. I shot this last night from the Frenchman River coulee, a wide valley cut at the end of the Ice Age by glacial run off, and occupied today by the meandering Frenchman River. It winds through the heart of Grasslands National Park and makes its way to the Missouri River to drain into the Gulf of Mexico, one of only a handful of rivers in Canada to do so. The river and wide pasture land made this a choice place for a ranch. For decades this was home to the 76 Ranch, one of the largest in Canada. 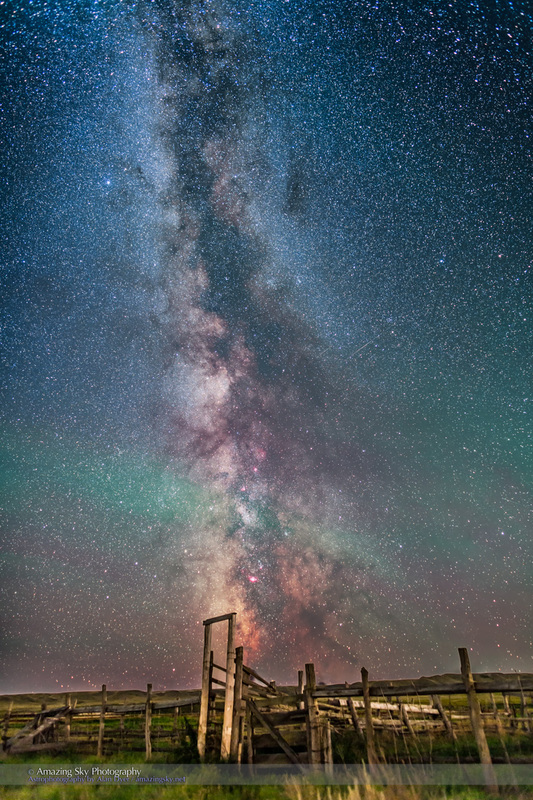 At right is its old wood corral, in front of the Milky Way and its “Dark Horse” structure in the dark lanes of the Milky Way. Appropriate I thought. The only lights visible are from spotlights from researches conducting studies of the nocturnal black-footed ferret. Otherwise, the site was as dark as you’ll find it in southern Canada. I assembled this panorama using PTGui software, from 8 segments shot with a 14mm lens in portrait orientation, all untracked 80-second exposures at ISO 4000 and f/2.8.